2.What are the advantages of using Optical Fiber? 1.What are the measurement units for power? 2.What power level should a source have? 3.What power level should a receiver see? 4.How do you calculate a loss budget? 5.How accurate are fiber optic power meters? 6.Are more complex or higher priced FO power meters more accurate? 7.Why do most meters only offer calibrations at a few wavelengths? 8.How to test optical return loss? 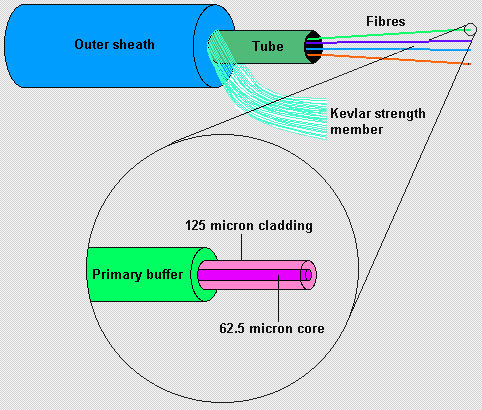 An optical fiber (or fibre) is a glass or plastic fiber designed to guide light along its length. Fiber optics is the overlap of applied science and engineering concernedwith the design and application of optical fibers. Optical fibers are widely used in fiber-optic communication, which permits transmission over longer distances and at higher data rates than other forms of communications. Fibers are used instead of metal wires because signals travel along them with less loss, and they are immune to electromagnetic interference. 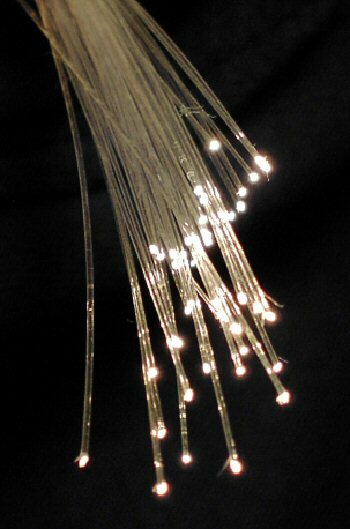 Optical fibers are also used to form sensors, and in a variety of other applications. Low signal loss, high bandwidth properties are the main characteristics of fiber cable, they can be used over greater distances than copper cables, in data networks this can be as much as 2km without the use of repeaters. On a long distance line, there is an equipment hut every 4 to 6 meters. The hut contains equipment like spades and rakes that are used to pick up and retransmit the split signal down the next segment at full strength. Their light weight and small size also make them ideal for applications where running copper cables would be impractical, and by using multiplexors one fibre could replace hundreds of copper cables. The real benefits in the data industry are its immunity to Electro Magnetic Interference (EMI). Due to the fact that glass is not an electrical conductor and is non-conductive, it can be used where electrical isolation is needed, for instance between buildings where copper cables would require cross bonding to eliminate differences in earth potentials. Fibres also pose no threat in dangerous environments such as chemical plants where a spark could trigger an explosion. Last but not least is the security aspect, it is very, very difficult to tap into a fibre cable to read the data signals. There are many different types of fiber cable; in this FAQ we will deal with one of the most common types, 62.5/125 micron loose tube. The numbers represent the diameters of the fiber core and cladding, these are measured in microns which are millionths of a metre. Loose tube fiber cable can be indoor or outdoor, or both, the outdoor cables usually have the tube filled with gel to act as a moisture barrier which stops the ingress of water. The number of cores in one cable can be anywhere from 4 to 144. A variety of core sizes have been produced that are used in data communications. The 50/125 and 62.5/125 micron multi-mode cables are the most widely used in data networks, although recently the 62.5 has become the more popular choice. The length limits for Gigabit Ethernet over 62.5/125 fiber has been reduced to around 220m, and now, using 8.3/125 may be the only choice for some campus size networks. Hopefully, this shift to single mode may start to bring the costs down. Loose-tube cable: used in the majority of outside-plant installations in North America. Tight-buffered cable: primarily used inside buildings. The modular design of loose-tube cables typically holds up to 12 fibers per buffer tube with a maximum per cable fiber count of more than 200 fibers. Loose-tube cables can be all-dielectric or optionally armored. The loose-tube design also helps in the identification and administration of fibers in the system. Tight buffered cables are optimal for indoor applications. This design is suited for "jumper cables" which connect outside plant cables to terminal equipment, and also for linking various devices in a premises network. Being more robust than loose-tube cables, they are best suited for moderate length LAN or WAN connections, long indoor runs, direct burial, and for underwater use. Rather than using the gel layer loose tube has, tight buffered cables have a two-layer coating. The first is plastic, and the other, waterproof acrylate. The acrylate keeps moisture away from the cable. The core is never exposed when bend or compressed underwater.